8 Decades of British Royal Corgis Reportedly at an End - The New York Times. 70 facts about HRH The Prince of Wales - The Prince of Wales. 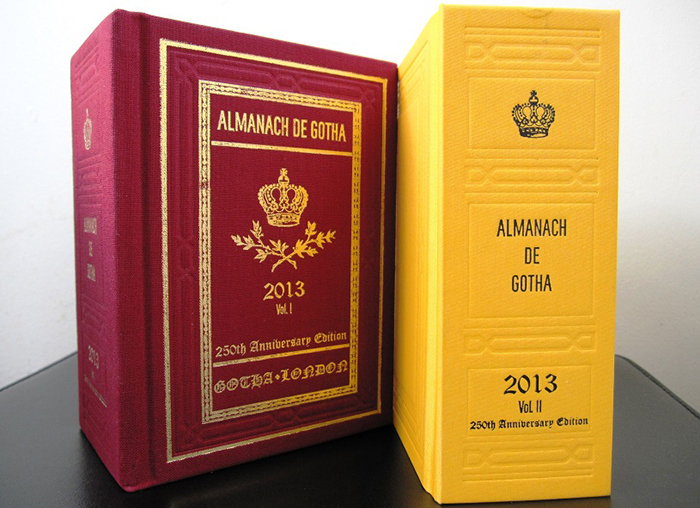 ALMANACH DE SAXE GOTHA - "The Original Royal Genealogical Reference Handbook." Annual Genealogical Reference: 1763-2010. Online. BURKE'S PEERAGE - founded by John Burke in 1826, Burke’s Peerage is the definitive guide to the genealogical history of the Royal families of Europe, the aristocratic and historical families of the British Isles, and the Presidential families of the United States. Castrum doloris - (Latin for castle of grief) is a name for the structure and decorations sheltering or accompanying the catafalque or bier that signify the prestige or high estate of the deceased. Charge (heraldry) - any emblem or device occupying the field of an escutcheon (shield). Coat of arms - heraldic design on a shield, escutcheon, surcoat, or tabard. 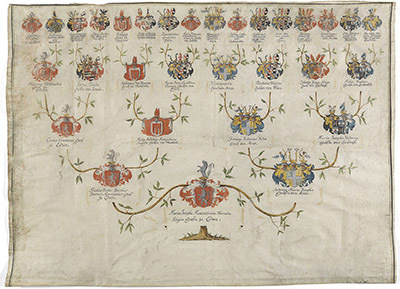 A coat of arms is used to cover, protect, and identify the wearer. Court Circular - the official record that lists the engagements carried out by the Monarch of the United Kingdom and the other Commonwealth realms; the Royal Family; and appointments to their staff and to the court. It is issued by Buckingham Palace and printed a day in arrears at the back of The Times, The Daily Telegraph and The Scotsman newspapers. An archive of the circular back to 1998 is provided on the British monarchy's website. Courtesy title - title that is not a substantive title but rather is used through custom or courtesy. Death of Count of Paris sparks pretend game of thrones in France - "Jean d’Orléans, descendant of Louis XIV’s brother, inherits a place in a theoretical tussle." DEBRETT'S Peerage and Baronetage - 147th edition, Britain's most prestigious genealogical reference work has mapped the ancestries of the British aristocracy for over two centuries. Denmark’s Prince Henrik Wanted to Be King. So He’ll Protest for Eternity - The New York Times. Diana: Closely Guarded Secret - Amazon.com. Diana Saved the Queen - The New York Times. Diana's fatal injury was tiny, just in the wrong place - "UK's top forensic pathologist DR RICHARD SHEPHERD who gave evidence in major inquiry into her death reveals how a tiny vein tear had devastating consequences for the princess in his memoir." Double-barrelled name - in British tradition, a double surname is heritable, and mostly taken to imply upper class origin, reflecting an alliance of a woman of higher class who married below her social status. Escutcheon (heraldry) - shield which forms the main or focal element in an achievement of arms. Golden Bull of 1222 - was a golden bull, or edict, issued by King Andrew II of Hungary. King Andrew II was forced by his nobles to accept the Golden Bull (Aranybulla), which was one of the first examples of constitutional limits being placed on the powers of a European monarch. Heir and a spare - aristocratic wives were once told they needed to provide an "heir and a spare" at least - and the same has always been true for the royals. Junker - definition & explanation. Kate Middleton's naked bum - Bild. King Richard III in Leicester - Leicester Cathedral. Lettre de cachet - (lit. "letters of the sign/signet") were letters signed by the king of France, countersigned by one of his ministers, and closed with the royal seal, or cachet. They contained orders directly from the king, often to enforce arbitrary actions and judgments that could not be appealed. List of heads of state and government by net worth - Wikipedia. List of shortest-reigning monarchs - Wikipedia. List of the richest royals - Wikipedia. 'London Bridge is down': the secret plan for the days after the Queen’s death - The Telegraph. Magna Carta - a charter, granted by King John to the barons at Runnymede in 1215, that is a basis of English constitutional tradition. MAJESTY MAGAZINE - "The Quality Royal Magazine." Marie-Antoinette's torrid affair with Swedish count revealed in decoded letters - The Telegraph. Meghan Markle is a ruthless social climbing actress - "... who has landed the role of her life and is determined to milk it for all she can - and that’s why the Palace is beginning to turn on her." Meghan: saviour of the royal family - or the ghost of Wallis Simpson? - "The Duchess of Sussex is already being portrayed as an American upstart out to destroy the monarchy." MONARCHIES IN EUROPE - Wikipedia. NEW MY ROYALS - "The World of Royalty, My Royal Family, New My Royal Family Fashion and Latest Royal News, Photos, Weddings and History." ORDER OF PRECEDENCE - definition & explanation. Patrilineality - system in which an individual belongs to his or her father's lineage. It generally involves the inheritance of property, names, or titles through the male line. Pluralis Maiestatis - definition & explanation. POINT DE VUE - French weekly dedicated to reporting royal events and royal families. A favorite reading material among the royals themselves. Prince Charles: This is the kind of King I will be - "In a new documentary celebrating his 70th birthday, Britain's Prince Charles spoke for the first time about what sort of king he will be, saying he will shift gears once he takes on the role of the monarch." Princess Margaret’s misadventures in bohemia - The Guardian. Privy Purse - the amount of money the monarch may use for private or personal expenses. Queen and the Queen Mother being taught a Nazi salute by Edward VIII - Daily Mail. Queen Elizabeth II has earned over $8 million in horse racing prize money - CNN. Queen Elizabeth II's private estate invested millions of pounds offshore - The Guardian. Roi fainÉant - definition & explanation. Rosvall Royal Books & Royalty Digest Quarterly - books and magazines on royalty. Royal family issues social media guidelines after Meghan-Kate abuse - "Britain's royal family has told social media users to show 'courtesy, kindness and respect' when interacting with its online posts, after repeated cases of online abuse directed at Duchesses Meghan and Kate." Royal fifth - old royal tax that reserves to the monarch 20% of all precious metals and other commodities (including slaves) acquired by his subjects as war loot, found as treasure or extracted by mining. The 'royal fifth' was instituted in Medieval Muslim states, Christian Iberian kingdoms and their overseas colonial empires during the age of exploration. Royal Musings - "News and commentary about the reigning royal houses of the United Kingdom, Sweden, Denmark, Norway, Belgium, Luxembourg, Liechtenstein, the Netherlands, Spain, Monaco -- and the former European monarchies as well." ROYAL PARDON - definition & explanation. ROYAL PREROGATIVE - definition & explanation. ROYAL TOUCH - (also known as the king's touch) was a form of laying on of hands, whereby French and English monarchs would touch their subjects, regardless of social classes, with the intent to cure them of various diseases and conditions. Royal Warrant Holders Association - formed in 1840. "Its main objective is to ensure the continued existence of the Royal Warrant as a treasured and respected institution. It helps to administer applications for new Royal Warrants and changes to existing ones." royalista - "The go-to place for everything royal." Salic Law - one part of Salic law that stayed very important was inheritance for kings. The Salic law said that land goes to sons and not daughters. SchÖnbrunner Deutsch - sociolect spoken by the imperial Habsburg family and the nobility of Austria-Hungary. It differed from other dialects in vocabulary and pronunciation; it appears to have been spoken with a slight degree of nasality. Secrets of the oil used to anoint the Queen at her Coronation - The Telegraph. She Met Her Prince (for Real!) at a D.C. Nightclub - The New York Times. Substantive title - title of nobility or royalty held by someone (normally by one person alone) and acquired either by direct grant or inheritance. It is to be distinguished from: a title shared among cadets; or borne as a courtesy title by a peer's immediate offspring; or acquired as a consort by virtue of marriage or grant. Thai king in crop top in German shopping centre - The Telegraph. THE GREATEST PARTY ON EARTH - "In 1971, the Shah of Iran, the self-proclaimed 'King of Kings', celebrated 2,500 years of the Persian monarchy by throwing the greatest party known in history." The king is dead, long live the king! - (French: Le roi est mort, vive le roi! ; Spanish: El rey ha muerto, ¡viva el rey! ), or simply Long live the king!, is a traditional proclamation made following the accession of a new monarch in various countries. The nobilities of Europe - by Melville Amadeus H. Ruvigny and Raineval, marquis de Ruvigny. THE PEERAGE.COM - a genealogical survey of the peerage of Britain as well as the royal families of Europe. The Princess Diana Death Pictures - The Freedom Fighter's Journal. The problem isn't Meghan Markle. It's the British monarchy - CNN. The Real My Royals - "News From Royals and Hollywood Stars." The Remains of the Romanovs - The New York Times. The Royal Digest - "Exploring Royalty Around the World." The Royal Disease - hemophilia is an X-linked recessive disorder characterized by the inability to properly form blood clots. THE ROYAL FORUMS - huge resource about royalty and princely families. The Royal Order of Sartorial Splendor - "Honoring All Things Elegant and Entertaining in Royal Fashion." The Royal Watcher - "This is a blog created by & for royal watchers. We post pictures, news, and cool facts about royal families around the world." The royal wedding - the full guide - "Take one prince and one American actor, add lashings of pageantry, souvenir shops and bunting to make that most British of jamborees - a royal wedding." The Story of the Royal Anointing Oil in England - "From the Sacred to the Fragrant." THE UK HONOURS SYSTEM - the honours system recognises people who have: made achievements in public life, committed themselves to serving and helping Britain. Tony Blair and Bill Clinton discussed 'falling star' Princess Diana hours after her death - The Telegraph. TWEET THE BRITISH MONARCHY - Twitter address (Verified Account). Why the lost kingdom of Patagonia is a live issue for Chile's Mapuche people - The Guardian.